at first I tried with a bootable USB that I made on my on Mac (before formating for the first time). It didn't work, when I began the installation process - after formatting my MacOS drive, an error occurred. Ok, I was kind of expecting that. the second time, I had already formated my HDD, so I made a bootable USB from my Windows 10 PC, using "TransMac". I dind't work this time, and the next. The error is: I plug the USB, Mac iniciates and while I'm pressing the "Option" key, it only shows the USB drive, and when I click on in to begin the install/format, the "blocked" sign appears and it stops there, on that loop. My MacOS drive doesn't appear, only the USB. When I click on the USB, it begins to load (I couldn't load all images). Then, when the bar loads, the "blocked" sign appears. First of all, like Allan mentioned in the comments, your MacOS drive will not show up on startup if you erased it. The reason the 'blocked' sign appears is because the installer files for OS El Capitan are corrupt on your USB. I also have a white MacBook from 2009 and I encountered the same issues when trying to install macOS Sierra from a bootable USB. 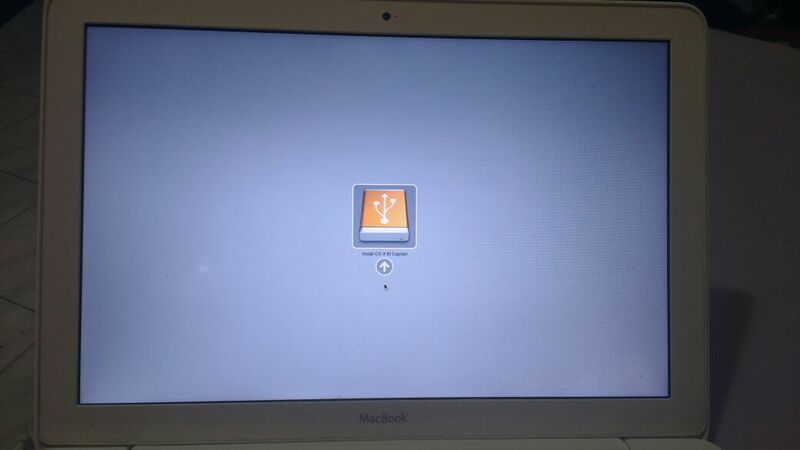 Run the bootable USB on your MacBook by using the steps you did before. This time, you should be able to get pass the 'blocked' sign. Format the HDD using Disk Utility from the Utilities Menu. Click the 'Erase' tab and set the format of your HDD to 'OS X Extended (Journaled)', then click erase. Your MacBook should then be able recognise the HDD. Install the OS X Yosemite on the HDD using the OS X Installer from the Utilities Menu. You can always update to El Capitan after you install Yosemite. You may have to configure the system time if you run into an error while validating the install. So you can boot from the USB drive, correct? If so, select the Disk Utility in the menubar and wipe your internal disk. Make sure to select "Mac OS Extended (Journaled)" and "GUID Partition Map" as described here. 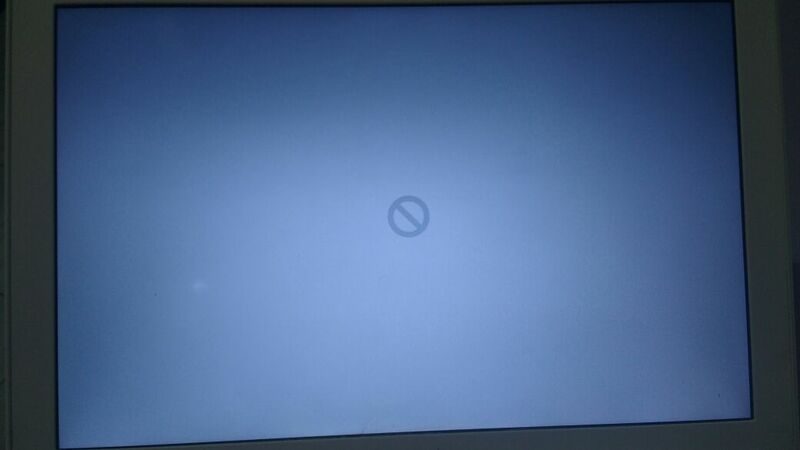 It is possible that your Mac is not compatible with OS X El Captian. Apparently you need at least an "early 2009" model. Did you check the System Requirements? If this is the case you can try some workarounds to get Sierra to run on your Mac. So when you see the 'blocked sign' (also known as the 'prohibitory sign', 'no entry sign' or 'circle with a line through it') what your Mac is telling you is that it cannot locate a drive with a bootable partition. What this means is that whatever drive the Mac was trying to boot to is either missing a critical boot file or it is damaged (and it either couldn't find another drive to try or it did but that one failed as well). Since you specifically selected the USB drive in an attempt to get it to boot, we know that it is in fact the drive it was trying to boot to. Long story short, your Mac is telling you that the "Bootable USB Drive" you created is not actually bootable. If it doesn't work, verify that the Mac still doesn't have a Recovery Partition option from the Boot disk selection screen (boot holding 'option' key). Unfortunately 99% of Macs from 2009 or earlier don't have the Internet Recovery option no matter which OS they've been upgraded to. If you have the original install discs that came with your Mac (or a retail version of Snow Leopard), this is where I'd resort to them because my next recommendation can be a headache (or you may simply not have the resources handy). I know it means starting from either Leopard or Snow Leopard and then upgrading, but it would be the easiest and cleanest way to move forward. If you don't have the original install disc or a retail copy of Snow Leopard, proceed. If you have access to another Mac you could attempt to put your empty Mac into target disk mode and reformat it using Disk Utility from the functioning Mac (booted normally, not to a Recovery mode). Then you could try to run the El Capitan installer right from there (after placing a copy of it into the /Applications folder), and select your Mac's internal drive as the install destination when prompted. You will need an App Store downloaded copy of the OS installer you're trying to install though, so if you don't have a functioning one you're going to need a solid internet connection to download one. If your Mac - for whatever reason - will not boot into Target Disk Mode, you could purchase (or borrow) and external drive enclosure, remove the hard drive from your Mac and install it into the drive enclosure, and then plug it in to a functioning Mac via usb. From there you would follow the same steps that I provided for Target Disk Mode - without booting into Target Disk Mode and instead just mounting the drive like a regular external HD - to format and reinstall. Your macbook 2009 (even early 2009) can handle El Capitan, but not Sierra. The USB stick is not good. Make a new one on a working mac with ElCapitan. "But, another worry that I have is: why my MacOS drive won't appear? " Because it is not bootable with an OS. You only see the bootable drives in the boot menu. Problem: You have no bootable media. The USB installer didn't complete thus making it "corrupt" and non-bootable. This is why you see the USB as a boot device, but then you get the prohibitory sign when you try to boot from it. The USB has a boot partition and the boot files exist, but the files are corrupt. The internal drive was wiped clean (formatted) rendering it blank and non-bootable as well. This removed the boot partition and the files so since they can't be found, the drive doesn't show up as a boot option. You need a working installer. Period. No amount of resetting the SMC or NVRAM is going to make a non-bootable USB installer suddenly bootable. The next step is to create a new USB installer. There are many excellent answers here on SE that already address this, so I won't belabor that point here. Take some time and read the answer to this question for details on how to do this. How to obtain the El Capitan Installer. I am NOT going to recommend that you could download and create an the Snow Leopard disks via bittorrent and do the installation and upgrade that way because this would be outside the scope... If you must install via a PC, don't create the USB. Burn an ISO (CD/DVD image) of SL and install that then upgrade to El Cap. First, before you erase your drive, make sure you have a working USB installer. You can boot the installer without actually committing to installing the software. You are just making sure it boots. If it boots, it works. Secondly...allow your installation of whatever you are doing (like creating the USB installer to finish). 98% is not 100% no matter how close it seems. Finally....this has been said countless times: Backup. Backup your backup. Time Machine is your friend. Not the answer you're looking for? Browse other questions tagged macos macbook el-capitan mac-pro formatting . How do I install OS X Yosemite on an unsupported MacBook?